Below are biographies and details of the 17 men commemorated on Hethersett War Memorial. We are indebted to Bea Ewart and Bob Andrews for allowing us to use extracts and details from their excellent booklet on The Hethersett War Memorials 1914-1920. We hope that the extracts below give some idea of the atrocious conditions and the way ordinary lives were destroyed by what became known as The Great War and the War to End All Wars (something of a real misnomer). It is our intention as we receive more information on individuals to set up their own sections. Robert BARTRAM - Private Robert John Bartram of the 11th Battalion Essex Regiment died on 21st April, 1917, aged 35 and is buried in Wimereux Communal Cemetery. Robert was the son of Mr and Mrs James Bartram of Hethersett. He was born in Ketteringham in 1884 and was previously in the Norfolk Regiment. It is likely that he served in the Norfolk Regiment before joining the Essex Regiment. In keeping with many other soldiers, home county did not always mean home regiment and often individuals were transferred between regiments to, amongst other things, make up the numbers. There is no record of Robert dying from wounds or being killed in battle, so it is highly likely that he was taken ill and hospitalised. From 1914 Wimereux was an important hospital centre and until June 1918 used the communal cemetery for burials. Once again this suggests Robert died in hospital. Horace BEAUMONT - Stoker Horace Beaumont of the Royal Naval Reserve was lost at sea on 12th December, 1918, aged 37. He is rememberd on the Chatham Naval War Memorial. The 1901 census shows that Horace was born in Mulbarton but was living with his uncle and aunt in East Carleton. His mother Ellen had died and he and his father, Robert, were sharing his uncle's home. At the time of death his next of kin was his sister May Smitherman who was living in Deal Kent. Horace died when his ship was torpedoed by a German U Boat. Horace was part of the crew of Merchant Fleet Auxiliary Vessel Eleanor which was engaged in taking a consignment of mines, depth charges and other munitions from Immingham on Humberside via Falmouth to Malta. When passing to the south of the Isle of Wight it was struck by a torpedo without any warning. The vessel sank within two minutes. All but one crew member was killed. The wreck of the boat is now a recognised grave site. Frederick BENNETT - Private Frederick Bennett of the 71st Company Machine Gun Corps (previously the Suffolk Regiment) was killed in aaction on 1st May 1917 and is remembered on the Loos Memorial in France. Frederick was born in Hethersett on 19th February, 1896 and baptised in St Remigius on 2nd April of that year. He was the son of Frederick and Elizabeth Bennett (nee Nobbs). His father died in September 1899 at the age of 30 and his mother re-married to William Denmark in September 1901. Frederick enlisted at Cambridge, which would suggest that he had already left Hethersett. He was moved from the Suffolk regiment to the Machine Gun Corps and most likely served as part of a machine gun team. Often the machine gun team had to stay put during an attack in order to lay down supporting fire. This made them extremely vulnerable. The Machine Gun Corps soon attracted the nickname of the Suicide Squad due to their poor life expectancy. Captured machine gunners of both sides often had to endure harsh treatment by enraged enemy troops who had seen their friends decimated by this devastating weapon. The heavier machine guns of both sides could comfortably find their targets at 800 yards and had a maximum range of approximately 4,000 yards. Even a mile or more from the lines, a soldier was still far from being safe. The artillery could fire at targets three to five miles distant and the larger calibre guns had an extreme range of 25 miles. Frederick was only 21 when he was killed. Although he is remembered on the Loos Memorial, he was not killed in the 1915 battle of the same name. It is more likely that he took part in the later Battle of Arras which was a major offensive planned to push the Germans back and break through the formidable Hindenburg Line. After initial Allied success, including the famous action at Vimy Ridge, the offensive became bogged down and the final objectivechieved despite 15,000 Allied losses against a possible 100,000 suffered by the enemy. William BISHOP - Private William Bishop of the 1st/5th Norfolk Regiment died in hospital on November 4th, 1917.. He was taken prisoner at the Battle of Gaza on April 19th, 1917 and for about five months was able to write home regularly. Suddenly in September 1917 his letters stopped and nothing was heard of him until the War Office announced that information had been received that he died of enteritis in hospital at Nigde in Turkey on November 4th, 1917. He left a widow and three sons. When William was 21 he was living in Beckhithe with his parents Arthur and Mary. In the 1901 census his father is shown as a farm worker and William was employed as a groom. At the time he had three brothers and four sisters. To his family the steady stream of letters must have been re-assuring, but the ongoing silence must have increased his family's anxiety. William was 37 when he died. Conditions for prisoners of war in Turkey were often harsh. The climate, conditions, poor food and contaminated water contributed to the illness that led to his death. His widow Vera Beatrice (nee Livick) lived at The Bungalows in Mill Road with their three sons who were all baptised in St Remigius - Victor William (20th August 1905), Edwin Albert (13th January 1907) and Russell Arthur (24th May 1908). William was buried in Baghdad. Frederick BLAKE - Private Frederick Stephen Blake of the 7th Battalion Yorkshire Regiment was killed in action on 14th May 1917, aged 35. He is remembers on the Arras Memorial in France. The Hethersett Parish Magazine reported his death in these words. Frederick Stephen Blake 2/5Yorks Regt, son of Mr and Mrs Blake, Hethersett, who has been missing since May 14th, 1917, is now reported to have been killed in France on that date. The son of William James and Elizabeth Blake of Cann's Lane, Hethersett, Frederick was born in Little Melton in 1882 and in the 1901 census is shown as aged 19, a stock feeder on a farm. His name is remembered on the Arras Memorial to the missing, as one of the many with no known grave. Many thousands of soldiers fighting on the Western Front were never found or identified. It is quite common in war cemeteries to see the words "A soldier of the Great War Known Unto God." William BRINGLOE - Rifleman William Bringloe of the 1st/12th Battalio London Regiment was born in 1889 and killed in action on 7th October 1916 aged 27. He is remembered on the Thiepval Memorial to the missing. It is with deep regret and real sympathy for those who are bereaved that we record the death of William Bringloe who was killed in action in France on October 7th last. He was attached to the 12th London Regiment and is the son of Mr William and Mrs Sarah Bringloe of this Parish. His age was 27 years. A memorial service was held for him on 25th November 1916. These dry and dusty fields were part of the area containing the Meteorological Trenches where in the autumn of 1916 both British and German barrages turned the whole sector into a sea of clinging mud and filth. On Saturday 7th October, William's Regiment began their attack on Dewdrop Trench. Unfortunately it failed and William was killed. William's brothers George, Henry and Bertie served in the Norfolk Regiment but returned home. The imposing Thiepval Memorial carries the names of 72,000 soldiers who have no known grave. It towers over part of the Somme battlefield. Ralph BUCKINGHAM - We have a special section on Ralph Buckingham which can be accessed from the menu at the top of the page. You can also access this by clicking here. Harry CHILDS - Private Harry Childs served in the 1st/4th Battalion Duke of Cornwall's Light Infantry. He died in hospital in Alexandria on 17th September, 1917. He is buried in the Deir El Bulah Cemetary, Israel. He is also remembered in the British School Tablet now in the Church Rooms, Henstead Road. Harry was born in Dolman's Yard, Barford, on August 20th, 1880, and his father was a boot and shoe maker. The 1901 census finds Harry living at home and employed as a gardener-domestic working for Major Evans-Lombe at Thickthorn Hall. The family now had premises in Henstead Road called The Elms. There were 10 children born to William and Louisa Childs - five boys and five girls. By this time the ledest son, Billy, had followed his father's footsteps into the boot and shoe trade, and the eldest daughter, Ada, was living and working at home as a dressmaker. Harry is said to have started a cycle agency and repair business in the early 1900s, trading as H.H. Childs, but sometime before the war began, Billy joined him and the business became Childs Bros with premises at the crossroads of Henstead Road and Queen's Road, opposite what is now the MacMillan Charity Shop. Harry's early service was possibly in the Territorials. It is likely that Harry was admitted to hospital on May 17th and died four months later. There is no record of his illness although many succumbed to illness caused by contaminated drinking water, poor rations, mounting fatigue and the extremes of heat by day and cold by night in the Middle East. Frederick CURSON - We have a special section on Frederick Curson which can be accessed from the menu at the top of the page. You can also access this page by clicking here. Frederick HARVEY - Private Frederick James Harvey of the 268th Employment Company died on 8th December, 1918 and is buried in Abbeville Communal Cemetery in France. Frederick was the son of Walter and Jane Harvey of Hethersett and left a widow, Alice Barbara, and a daughter Cecilia Violet who was baptised in St Remigius on 30th August, 1908. In the 1901 Census Frederick is recorded as 17 and lodging in Carrow Road, Norwich. He appears to have been employed at that time as a tin worker, possibly a machinist working on the railways. Frederick died, aged 35, from pneumonia, following influenza, four weeks after the Armistice. The Great War claimed the lives of 8 million men, but the influenza pandemic was to bring more misery and death around the globe - accounting for between 20 and 40 million people. Frederick would be suffering from poor nutrition and exhaustion from his years of war service. His resistence to any infection would have been low. He had been transferred from the 2nd/8th Battalion of the Royal Scots into the Labour Corps, so it is quite likely that he had been previously wounded or gassed and had been found unfit to return to the front line. It is possible that Frederick died in a French Hospital. It was with very great regret that we learnt of the death of Corporal Arthur Hubbard, 7th Batt Norfolk Regiment. He was killed in action on September 18th, 1918. He leaves a widow and three children and two adopted nephews. We offer to those who mourn our deep and sincere sympathy. Arthur and his wife Agnes Ruth had three children who were all baptised in St Remigius Church. They were Clive George Frederick on 17th December, 1912, Norman Arthur and Vera Rose Mary, possibly twins, baptised 13th May, 1917. In the 1901 Census Arthur is recorded as being 10 years old with an elder brother Frederick, aged 14, who was a baker. His parents, George and Rose, lived in Mill Road in the village. Arthur's war experiences were cruel but not uncommon. He suffered previously with multiple gunshot wounds to his right leg and was later gassed, both injuries requiring periods of hospitalisation. He is recorded as missing on 18th September and so it is assumed that he was killed in action on that day. He is buried with 23 other Norfolks in Epehy Wood Cemetery. All 24 men are shown as being killed on the same day. It is known that there was an attack on Room Trench that day resulting in 120 dead, wounded or missing. Benjamin JOY - Private Benjamin George Joy of the 2nd Battalion Suffolk Regiment was killed in action on 28th March, 1918 and is remembered on the Arras Memorial, France. He is also remembered on the British School Tablet now in the Church Rooms in Henstead Road. Benjamin's birth was registered in Henstead in June 1894. He enlisted in Bury St Edmunds, which suggests that he had left the village to follow his own path and that is probably why he found himself in the Suffolk Regiment. Benjamin George Joy, son of Mr and Mrs B. Joy of Hethersett was killed in action in France on March 28th, 1918, aged 24. Private Joy first went abroad in July 1916 and was wounded on April 11th last year. We offer our deepest sympathy to those who have been bereaved. A memorial service was held on April 21st. March 1918 was a month that would bring many casualties on both side and to many was the beginning of the final chapter of the conflict. The German High Command knew that the entry of America into the war, had given the advantage to the Allies. The Germans tried to split and destroy the British and French before the Americans arrived. A massive attack was opened along a 50 mile front beginning on March 21st, 1918. The Germans made remarkable gains over the following days, despite many instances of heroic and stubborn resistance by Allied troops. Eventually the Allied campaign ran out of steam, due to over stretched communications and supply lines. Benjamin's 2nd Suffolk Battalion suffered a heavy bombardment on 21st March and was withdrawn on 23rd to reserve trenches to the northwest of Wancourt village. On 27th March they were moved forward again into the front line trenches overlooking the village. It is likely that the trenches were no deeper than three feet. The Germans bombarded the trenches, but still the Allies fought on. Over 400 of the battalion had become casualties and those who remained were forced to surrender. Sidney LIVICK - Lance Corporal George Sidney Livick (commemorated on the Hethersett War Memorial as Sidney Livick) was killed in action on 26th September 1915, aged 29. He was serving in the 9th Battalion Norfolk Regiment and is remembered on the Loos Memorial in France and also on a special tablet containing five names in Hethersett Church Hall in Henstead Road. He was born on 30th May, 1886, the son of John, a railway platelayer, and Amy, of New Cottages, Station Road, Hethersett. He was baptised in St Remigius Church on 4th July, 1886.
here they took up positions only gained from the Germans the day before. The attack was launched at 6.45 a.m but advance was impossible due to heavy fire, especially from snipers who inflicted heavy casualties. The men were forced to take refuge in the trenches whilst other troops carried on the attack. At 7 p.m the enemy, using the light of flares, set up a fierce rifle barrage on the Norfolk's trenches. The 9th Battalion was eventually relieved by the Grenadier Guards with orders to assemble at Vermelles, from where they were marched back to Lonely Tree Hill, arriving at 8 a.m the next day. In all there were 209 casualties, five officers and 39 men killed and nine officers and 121 men wounded and 34 of all ranks missing. Sidney was one of the last group and was never found or identified. George Moore - Private George William Moore of the 1st/4th Battalion Norfolk Regiment was killed in action aged 34 and is remembered on the Jerusalem Memorial in Israel. He went missing following the Battle of Gaza and was the subject of the following announcement in Hethersett's Parish Magazine of November 1918. The whole Parish is sorrowfully aware that George Moore has been missing ever since the Battle of Gaza. He was last seen on April 19th, 1917. We regret to announce that the War Office has recently stated that he is believed to have been killed on that date .... in losing George Moore we have lost an upright Christian man .... His unimpeachable character won for him the respect in which he was held by all who knew him. He leaves a widow and a little boy. The announcement brought to an end the long months of uncertainty for his widow Emma Maud Moore and his parents George and Maria. His son Richard George was born while his father was away at war. George was baptises on 21st January 1917 and lived with his mother in Rose Cottage, Hethersett. George was in a Territorial Battalion. Territorial soldiers were called up before war was officially declared and the 1st/4th Norfolks were called to assemble in Chapelfield in Norwich on 4th August, 1914, from where they travelled to their appointed destinations. Initially it was assumed they would be employed on home defence duties, but they were soon given the opportunity to indicate if they would be prepared to serve overseas and the majority agreed to do so. On April 19th, 1917, the Norfolks were engaged on an attack on Gaza after which George was reported missing. His body was never positively identified and he has no known grave. Thus his name is remembered on the Jerusalem Memorial. At 7.30 a.m, it then being broad daylight, the Norfolks commenced the attack from the ridge. There, as at most points, more than a mile of almost level country with little cover before the enemy trenches could be reached. The Norfolks on arriving about 800 yards from the enemy trenches came under a very heavy and accurate belt of crossfire from the machine guns which swept ground entirely devoid of cover. They tried to press quickly on, but could not pass through the belt and suffered very heavy casualties, nearly 75% being seriously wounded or killed. The groans and calls of the wounded could be heard but to send a party into that belt meant certain death and drew heavy searching fire on those that were there. Arthur NINHAM - Private Arthur Charles Ninham of the 1st/9th Battalion Durham Light Infantry was presumed killed in action on 8th November 1916, aged 21. He is buries in Dernacourt Communal Cemetery in France. In the 1901 census Arthur is aged five and, along with his brother Frederick who was a year older, was living in High Street, Ketteringham in the care of his uncle and aunt Frederick and Emily Grimson. Frederick worked as a farm horseman and Emily was a housewife, looking after the two boys. The Commonwealth War Graves Commission records the boys' parents simply as Mr and Mrs Ninham, living in Newfound Lane, Cringleford. They were married in 1889 in Blofield and both of their sons were born there. It has never been established, however, why the boys were living with their aunts and uncles. When war came the two young men enlisted but only Frederick, who served in the 2nd/4th Battalion Norfolk Regiment returned home. In early November, 1916, following heavy rains and cold weather, ground conditions were deteriorating fast. Onmber the 6th, 8th and 9th Battalions of the Durham Light Infantry were part of an attack intended to secure, amongst other things, the Butte de Warlencourt, a prehistoric mound and the only piece of high ground in the vicinity. They were also trying to secure a nearby quarry. The small hill had been fought over many times and Arthur had probably "gone over the top" in this area previously. The day was to become famous in the annals of Arthur's regiment. Facing withering machine gun fire, the men in the Durham Light Infantry had to struggle through the clinging mud at an agonisingly slow speed, with only water filled shell holes for temporary refuge. Even so some managed to get over two lines of enemy trenches, into the quarry and part of the German trench system, where they consolidated their gains. They fought all day despite several enemy counter-attacks, but each fresh assault reduced their numbers further, and eventually they were forced to abandon their positions, many fighting to the end rather than run. It was in these appalling conditions that Arthur may have lost his life. His date of death is presumed as he had not been seen for some time. For the following three days activities were relatively quiet, so it is quite possible that he may have been one of the courageous men who reached the German lines but didn't return. Arthur lost his life in what was one of the final actions of the Battle of the Somme, which had lasted from late June to the first few days of November 1916, and had cost and estimated 419,000 British, 204,000 French and between 660,000 and 680,000 German casualties. The death and destruction lasted far beyond the catastrophic 1st July, the day that many people think started and finished the battle. By early November the troops on both sides were exhausted and demoralised. The planned and hoped for British and French breakthrough had ground to a halt, but valuable lessons had been learned which would be developed and would lead to victory some two years later. Harry SERGEANT - Private Harry Sergeant of the 1st/4th Battalion Norfolk Regiment was killed in action on 19th April, 1917, aged 35 and is buried in the Gaza War Cemetery, Israel. The parish magazine of March 1918 includes the following notice. News has been received that Private Harry Sergeant who has been missing since 19th April, 1917, was killed in action on that day. Sincere sympathy will be felt by all for his relatives after their anxiety and suspense for so many months. Born on 7th December 1882 and baptised on 4th February 1883 in St Remigius Parish Church, a memorial service was held on Sunday 10th February. The officer in command of Harry's platoon wrote as follows to his mother: Your son was in my platoon for about six months prior to the attack and was a very good soldier. He was always a great help to me since his experience of Gallipolli ... The Regiment will lose by him one of its best men. Harry's parents, Henry and Sarah, according to the 1881 census lived in Cann's Lane Cottage, Hethersett. Henry was a labourer. The cricket ground, which Mr Back has kindly placed at their disposal, forms an admirable drill ground. It is most likely that Harry was called up on a war footing basis on 4th August, 1914, being directed to Chapelfield in Norwich. April 19th, 1917, was the date of the second Battle of Gaza. The second attack saw the loss of many lives, one of whom was Harry Sergeant. Arthur SHORTEN - Private Arthur Henry Shorten of the 1st/4th Battalion Norfolk Regiment died of wounds on 3rd November, 1917 and is buried in Gaza War Cemetery, Israel. He is another soldier commemorated on the tablet which can be seen in the Church Hall Rooms in Henstead Road. 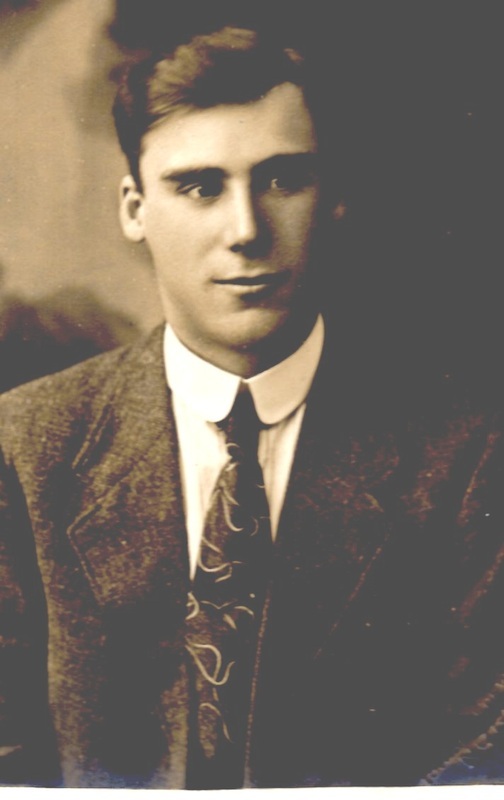 Arthur was born in Norwich on December 8th, 1890, the son of John and Helen Shorten. He was baptised in St Remigius on October 6th, 1895. His father was a railway platelayer. In the parish magazine prior to the dedication of the war memorial it was stated that Arthur was killed at the Battle of Jaffa. This is incorrect as he died from wounds received in the third battle of Gaza. It is likely that Arthur was wounded on 2nd November and died from his wounds the next day. Arthur as another Territorial Soldier who found himself serving in the Middle East where at times there was more danger from disease than from enemy fire. 31st July 1917. Aged 37 Years. John enlisted on 8th December, 1915, but, as he had no military training, his first application for a commission was rejected. When he finally became an officer on 24th October, 1916, he was sent overseas immediately. At the time of his death he was a signalling officer with the 16th Battalion Rifle Brigade. A popular leader, he was known to his younger colleagues as "Father" Barrett. His own father was a solicitor and the family lived at Upton in Essex. After being educated at Merchant Taylor's School in London, he went on to study at Oxford, where he was awarded a half-blue for tennis. He was also a keen cricketer. John was killed on the opening day of the Third Battle of Ypres, better known as Passchendaele. The opening assault on 31st July, 1917, is generally known as the Battle of Pilckem. An artillery bombardment took place day and night. It is estimated that 4.3 million Allied shells were fired into the German lines. Even after all that, some German strongpoints remained and had to be overcome before any advance could be made. John married Evelyn Back, one of five daughters of William and Marion Back of Hurn House, Hethersett on 11th September, 1912. St Remigius Church was packed for the service with relations, friends and parishioners, who had seen the bride grow up in the village. John became a brewer for Morgan's in King's Lynn where the family lived at 12, Portland Street. He was a prominent member of All Saints Church, South Lynn, acting as church treasurer for a time and he is remembered on a memorial window there although his surname is spelled as Barratt. The couple had four children - three being baptised in St Remigius - John Henry on 24th August, 1913; Lawrence Ambrose on 5th December 1915 and Elsie Sybil on 25th May, 1917. At the time of his death the records show his wife living at 139 Newmarket Road, Norwich. Bertie SPARROW - Private Bertie Sparrow of the 5th Battalion Royal Inniskillin Fusiliers was killed in action on 8th October, 1918, aged 27, and is buried in Beaurevoir British Cemetery in France. He is also remembered on the memorial in his home village of Denham St. Mary. Bertie had previously served with the Royal Field Artillery - as losses mounted men were moved to different units and given a new service number. The parish magazine of January 1919, carried the news that Berties had been killed together with the fact that, at the time of enlistment, he was a lodger in Hethersett, The exact location is unknown. He was born in Denham St Mary near Bury St Edmunds, Suffolk, to George and Eliza Sparrow in June 1891. His father died at the age of 39 in September, 1897, and in the 1901 census Bertie 9, his mother, aged 43, his elder sister Daisy, 11, and his younger brother Harry,8, were all living in Denham Road, Denham, Suffolk.